Every parent wants a healthy baby, but common maternity practices may actually make it harder to have a safe and healthy birth. Here is the straight scoop on some common interventions. 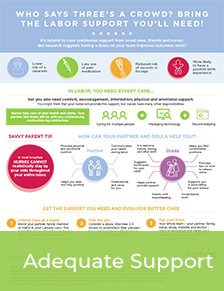 This information, and what you learn in a Lamaze childbirth class, can help you collaborate with your care provider to have the best birth day possible for you and your baby. Let’s be honest. Most of us would love to avoid the pain of labor and birth, but epidurals have both “pros” and “cons.” We already know the good part: a reduction in pain for you. But there’s less talk about the downside. It’s important to know that epidurals can set the stage for slower labor, more difficult pushing and dangerous blood pressure changes—all factors that can lead to a caesarean delivery. You may not get support for exploring other, more natural pain relief options like movement, focused breathing, a warm tub or massage (ahhhh!) to keep pain in check. So, weigh the risks and benefits before agreeing to an epidural; it’s an important step in making this personal decision. 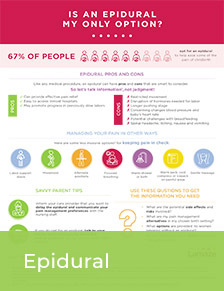 Infographic: Is an Epidural My Only Option? Cesarean delivery can save lives, plain and simple—but, it’s pretty major surgery, and like any other surgery, it carries risks for you and your baby. So, there should be a really good medical reason to use it, right? It’s sad to say, but more and more babies are being delivered by cesarean even when there’s not a good medical reason to do so. In the United States, about one in three will end up in the operating room. Some people are told they are too overweight, too short or too old for vaginal delivery. Others are told their babies are too big or coming out too slowly. Parents who have already delivered a baby by cesarean often are told that a vaginal birth after cesarean (VBAC) is off-limits and another cesarean is their only option. Many of these reasons sound like solid medical thinking, but aren’t actually supported by the research. 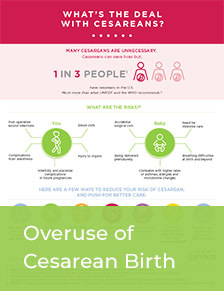 Infographic: What's the Deal with Cesareans? An increasing number of hospitals are cracking down on inductions, and for good reason. Artificially starting labor may be good for a care provider juggling a busy calendar—or for your family members who want to book their plane tickets—but it can make labor harder and more painful for you, and stress and/or jeopardize baby’s health. Studies have consistently shown that the risk of having a caesarean for first time parents nearly doubles with induction. It also increases your baby’s chance of being born premature. That’s because due dates aren’t an exact science. Even if you and your care provider are positive about your dates, every baby matures at a different rate. Inducing labor can mean your baby is born before they are ready. Aside from the risks of induction, there are specific benefits to letting labor start on its own. During the last part of your pregnancy, your baby’s lungs mature and get ready to breathe. They also put on a protective layer of fat and develop critical brain function through 41 weeks of pregnancy. Cutting the pregnancy short can be tough on your baby, who is still going through these developmental phases. 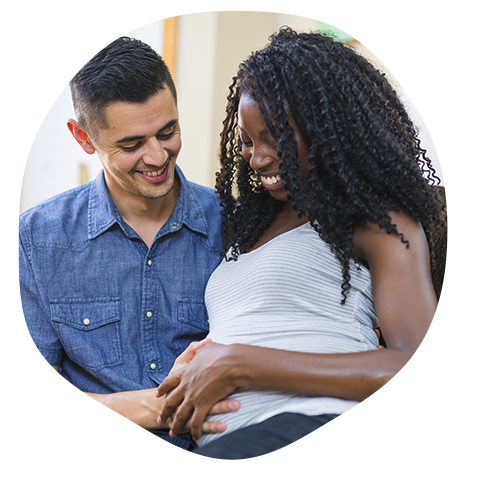 Before agreeing to an induction, take time to learn more about the benefits of letting labor start on its own. Infographic: To Induce or Not Induce? There isn’t a parent on the planet who wouldn’t love a way to monitor every moment of her baby’s in utero existence. We all want to know our babies are doing well. Using the same thinking, most care providers will monitor you baby’s every heartbeat during labor using electronic fetal monitoring, or EFM. It’s worn like a belt around your belly and, as long as you don’t move, it will record every heartbeat on a little strip of paper. Your care provider will watch the monitor and that little strip of paper for signs of trouble. Sounds great, right? Well, there’s a catch. Actually, three big catches. It doesn’t work. 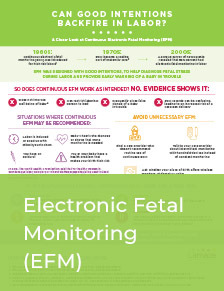 It’s natural to think that using EFM would help care providers spot babies who are in trouble, but every study that has ever been done has shown the same thing: Using EFM doesn’t help improve the health and well-being of babies. EFM can lie. Well, not on purpose, but studies show that EFM can frequently give a false signal that a baby is in trouble. This means an emergency cesarean, even though baby is perfectly happy and healthy. EFM confines you to bed. The best way to move your baby OUT is to get yourself up and moving. If you’re stuck in bed, you’re not able to help your baby on that journey. What’s the alternative? Studies show that a baby’s heart rate can be monitored just as safely by a nurse, doctor or midwife regularly checking in to listen at key points in your labor with a Doppler stethoscope. Talk with your health care provider about using intermittent listening, so you can move freely, relax between contractions and avoid the anxiety that comes with being tied to a machine. Keep in mind that if you have a medical complication, if your labor is induced or sped up artificially, if you have an epidural or if a problem develops during labor, you will likely need continuous EFM. Otherwise, it can be safer and healthier to have intermittent monitoring. The American Congress of Obstetricians and Gynecologists, as well as the Society of Obstetricians and Gynaecologists recommends listening to your baby’s heartbeat at key points in your labor for low risk women. In contrast to what you see in movies and on TV, lying on your back in a hospital bed is not the only way to give birth! In fact, walking, moving around and changing positions throughout labor makes giving birth easier. Movement is the best way for you to use gravity to help your baby move down the birth canal and through your pelvic bones. Staying upright actually increases the size of your pelvis to make it easier for your baby to fit and rotate as necessary. When it comes time to push, staying off your back and pushing with your natural urges can be key to making it as easy as possible on you and your baby. Be wary of anyone trying to “direct” your pushing. Nobody should be counting for you or telling you to hold your breath. It increases the risk of pelvic floor damage and actually can deprive your baby of oxygen! Keep in mind that if you have an epidural or continuous EFM, this will drastically restrict your movement during labor. Learn more about how movement in labor, as well as how pushing upright and with your natural urges, can improve your chances of a healthy, safe birth. They don’t call it labor for nothing! For many, labor is a physically intense experience that is demanding on the mind and body. 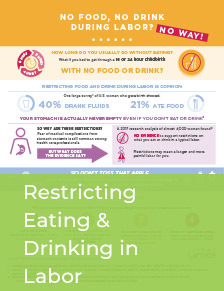 Unfortunately, eating or drinking in labor is routinely restricted, which can mean running out of energy when it's needed most. The restrictions come out of concerns that if a surgery is needed, it is ideal that the patient have an empty stomach. But research shows that modern anesthesia techniques make complications from food in the stomach exceedingly rare and that eating and drinking during labor can be safe. So, be prepared. Make a point of discussing this with your care provider and be sure you’re able to get the nourishment you need to do the hard work for labor. Research shows that having continuous labor support from a friend, family member and, especially, from a professional labor assistant known as a “doula,” results in easier and slightly shorter labors. Many people count on having a nurse by their side to provide this support. Sometimes that happens, but most labor nurses are caring for several patients at the same time and don’t have the time to provide contraction-by-contraction support. Your support person often is expected to fill this role, but they are new to the process too, and often need cues on how to best be supportive. So, think about having a doula or consider whether you know someone who is especially knowledgeable about childbirth. Having someone you trust by your side can help you manage your labor, support good decision-making and help make sure you’re able to communicate your wishes to your health care provider. Infographic: Who Says Three's a Crowd? Labor is over and your bundle of joy has finally arrived! But before you know it, your baby is whisked out of your arms or away to the nursery. That’s because in many hospitals, it’s standard procedure to take the baby for a period of time to complete some nursing tasks. However, research has shown that it’s best to keep a healthy baby with you after birth. Talk to your care provider and make sure they allow “rooming-in,” which will maximize your time with your little one and opportunities for breastfeeding. Don’t forget to talk about what will happen immediately after birth, too. Many things like weighing, measuring and bathing are not urgent and can be delayed, be done at your bedside or right on your tummy to ensure you and your new baby don’t miss any precious moments together. 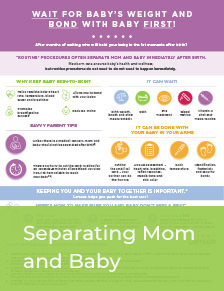 Infographic: Wait for the Weight and Bond with Baby First! If you have previously had a cesarean delivery and become pregnant again, you may want to consider a vaginal birth after cesarean (VBAC) for your next birth. This is a personal decision and there are many factors to consider, but 90 percent with a past cesarean are candidates for a VBAC. Once you’ve made a decision, one key element of a successful VBAC is having a supportive care provider. It’s important to understand the facts, get support and ask the right questions to ensure you and your provider are on the same page. 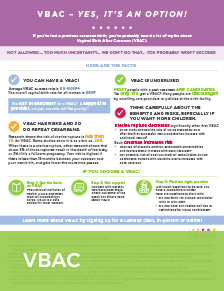 Infographic: VBAC-- Yes, It's an Option!